For most hulls the center of buoyancy is below the center of gravity and the hull is said to be meta-stable. that tries to move the hull back to the upright position. Engineering ToolBox, (2008). Center of Gravity and Buoyancy. 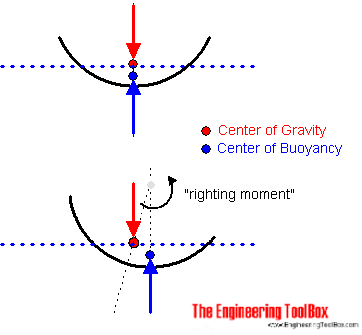 [online] Available at: https://www.engineeringtoolbox.com/centre-gravity-buoyancy-d_1286.html [Accessed Day Mo. Year].